Ok, the final push is on! Friday is the Open House for my Operation Write Home card drive. I am trying to step up the pacing and actually create a few more cards at a time. I am not known to make cards quickly so this is harder than I thought. The effort is made easier when you have a good sketch and a challenge to stay Clean and Simple. The sketch comes from the Operators over at Stamping 411 and it is another great one. They have added some wonderful features over there so please go and check them out. What a wonderful resource they are!! The Paper Players threw out a Clean and Simple challenge for the week…perfect for me!! One of the things I have been trying to do with my Operation Write Home card making process is use all my lovely (previously hoarded) retired designer papers. In today’s card, I used some of my old Parisian Breeze Specialty Paper. I also pulled out one of my very favorite retired stamp sets, Branch Out. I don’t hold on to many of them but this one sure is a keeper! All I did was stamp the main image panel (3″x3 3/4″) and then cut it into 3 one-inch strips. It adds a lot of visual interest with almost no extra work…translated, simple. The ribbon is retired Kraft Taffeta Ribbon and I just tied on a retired Chocolate Corduroy Button. Tying on a button is WAY faster than any bow…yep, more simple. The sentiment comes from the Apple Blossoms Hostess Level 2 set and, other than the actual card colors, is the only current thing on this card. I think this is exactly the kind of card that will be perfect for one of our heroes to send home! Now I don’t feel so bad for having kept these beautiful retired products. I’m so glad they can go to a wonderful cause!! If you haven’t ever thought about it, consider putting together your own box to send. The wonderful volunteers at Operation Write Home make it very easy. Have a wonderful and safe Labor Day! Lovely card and I am sure they will appreciate getting it to give! Great card! Fabulous use of the sketch! 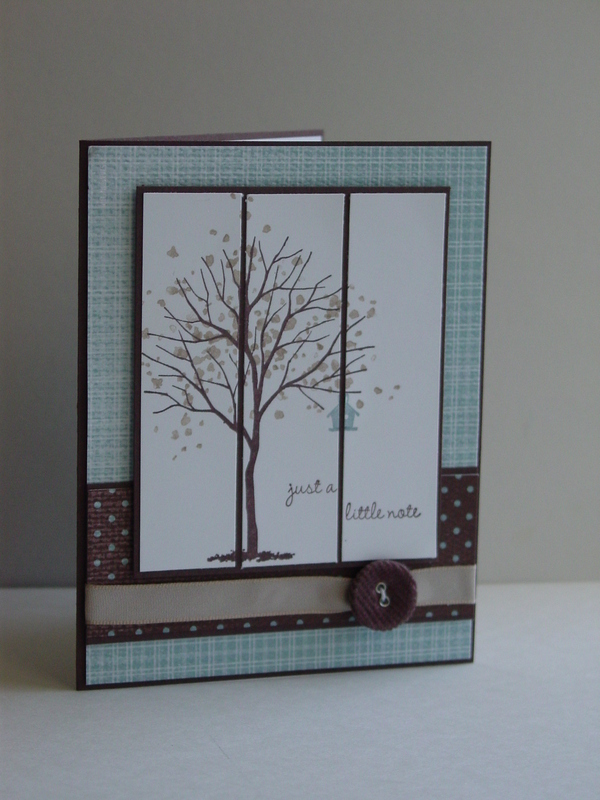 Oh I just love the colours you have chosen and the way you have used the Stamping 411 sketch…perfect for the tree stamp! Thanks for playing with the Paper Players this week! This is absolutely stunning! A perfect use of the sketch and a most worthy cause! Thank you for making a difference for those folks serving overseas. Love that stamp with this sketch…it works SO well! Good luck with your Operation Write Home! This is beautiful! I love how you used Branch Out with the 411 sketch and I love the taffeta ribbon with the corduroy button. Thanks for joining us at the Paper Players this week…cheers! Perfect clean and simple card! Love the serene colors. Thanks for joining The Paper Players this week! What a fabulous card for a fabulous cause! I love the soft colors you chose. A perfect CAS card. That is a beautiful cause, and I am sure it will make more than one person very happy! 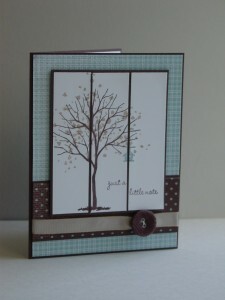 Lovely card–I have always liked this tree image and the color combo is one of my favorites too! Thanks for playing with the PP this week! Fabulous card. Love the LO – you did a great job with it! Jen, once again, your work elicited a sigh when I saw it! I swear, I have more of your cards than most anyone else’s saved for future reference. Don’t worry about the number of cards you make – OWH stresses quality over quantity! Love it! Love the color combination! This stamp set never gets old! What a fabulous card! This is so soft and beautiful!!! I love it and really miss this stamp set!! Thanks for playing along with us this week!! Jenn, congratulations for this exceptionally well deserved honor! Gorgeous card,too!